Download this handy list of National Wildlife Refuges with Trumpeter Swans at some point during the year. Visit the Refuge website for information about location, hours, maps etc. You can see Trumpeter Swans at some point during the year at over 60 National Wildlife Refuges. Use this National Wildlife Refuge System website to find the refuge you would like to visit, hours, location and maps. This 8 page document written in 1995, includes excellent discussions of basic biology, historic and current distribution with very good range maps, a summary of restoration efforts in the Midwest, and much more. This is publication G3647 of the University of Wisconsin - Extension, written by Sumner Matteson, Scott Craven and Donna Compton. The Society gratefully acknowledges the University of Wisconsin Extension Service for permission to post this document on our web site. This excellent paper, presented at our 21st Swan Conference, has great information about general Trumpeter Swan issues in its first 4 pages. While the title is about Wisconsin swan survival, it includes information about the very early history of return of the Trumpeter Swan, the lack of migration traditions (which is why TTSS began Trumpeter Watch), what Trumpeter Swans eat, when they field feed, the general causes of swan deaths during particular periods of their lives, and much more. While written in scientific language, it gives a great overview of many Trumpeter Swan issues. The most up to date and most complete single sources of scientific information for all three species of North American Swans are the species accounts from The Birds of North America. This series is jointly published by The Academy of Natural Sciences, and The American Ornithologists' Union. Your local library, university, or natural history organization may have a subscription to this series. Single copies of the species profiles for the Trumpeter Swan (No. 105), Tundra Swan (No. 89), and Mute Swan (No. 273) can be purchased from Buteo Books, 3130 Laurel Road, Shipman, VA 22971. 800-722-2460 or 434-263-8671. This 2015 report is the most current information about Trumpeter Swan populations across North America. It is a survey by the United States Fish and Wildlife Service that has been conducted every 5 years since the late 1960s. 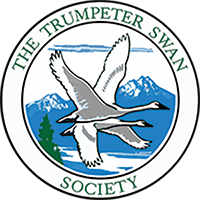 The Trumpeter Swan Society has been an important partner in its planning. For more information, read the 1955 classic "Travels and Traditions of Waterfowl" by H. Albert Hochbaum. A founder of TTSS, Hochbaum's final chapter "Broken Traditions" provides eloquent recognition of this invisible and long-term damage to Trumpeter Swan populations. This classic 1960 monograph is the "swan bible" for learning more about Trumpeter Swans. Winston Banko researched Trumpeter Swans at Red Rock Lakes National Wildlife Refuge. This book is in virtually every agency swan manager's library. It is also a great reference for teachers.